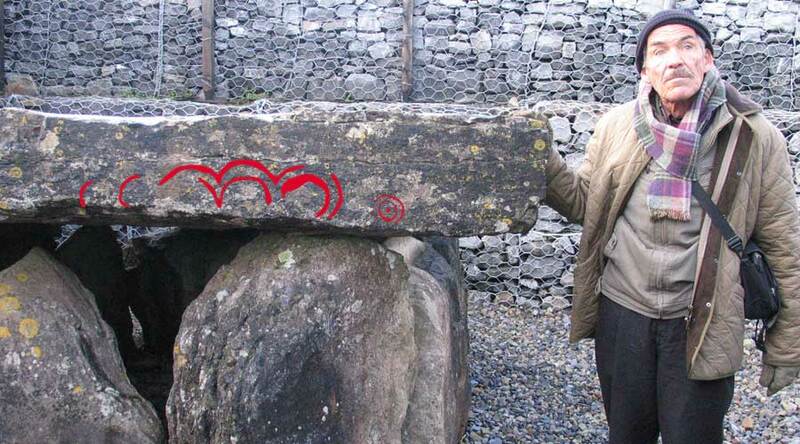 Researcher Martin Brennan at Carrowmore 51, Christmas 2009. The engraving is highlighted using photoshop. The oldest date recovered so far from Carrowmore, 5,400 B.C., is extremely early and most Irish archeologists have dismissed as being too old. The general opinion today, based on Burenhult's research, is that Carrowmore is an early site from around the time mesolithic hunter-gatherers were turning into neolithic farmers. In 2002 an archaeology seminar called 'Stones and Bones' was held in Sligo in honour of Michael O'Kelly, the excavator of Newgrange. Göran Burenhult, who was invited to dig at Carrowmore by O'Kelly, hosted the seminar. 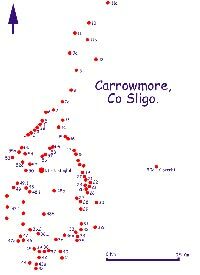 The dates below are his latest published work on Carrowmore, and are somewhat re-calibrated from his contraversial early dates. Swedish excavation at Carrowmore 27. 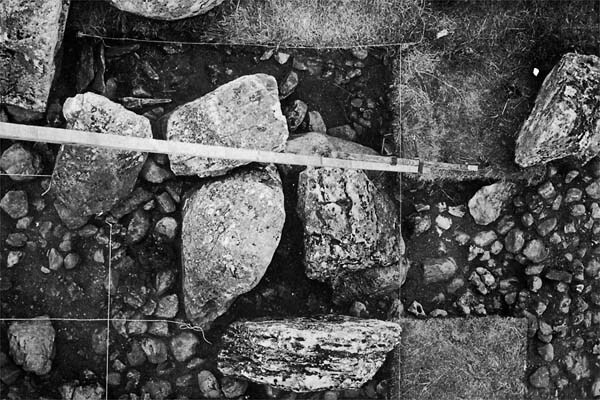 This is a verticle photo of one of the three recesses of the chamber, the only cruciform chamber found at Carrowmore. c.4300 cal BC: charcoal from stone socket. Five dates between 3300 and 2500 cal BC. c. 4200 cal BC: charcoal from post hole in central chamber. c. 3950 cal BC: charcoal from cremation in central chamber. charcoal from stone packing outside the central chamber. Tomb 51 c. 4100 cal BC: charcoal from possible satellite south of kerbstone circle. Nine dates from charcoal in ritual type pits and burnt layers around central chamber, centring on 3550 cal BC. Tomb 55A c.3800 cal BC: charcoal in cremation layer. Tomb 56 c. 3500 cal BC: charcoal from stone packing outside central chamber, Primrose Grange Tomb 1 c. 6400 cal BC: charcoal in stone socket. Five other dates between c.4300 and 3000 cal. BC. Burenhult, G. 2003 'Megalithic Chronologies'. In G. Burenhult (ed.) Stones and Bones: formal deposition of the dead in Atlantic Europe during the Mesolithic-Neolithic interface 6000-3000 BC. 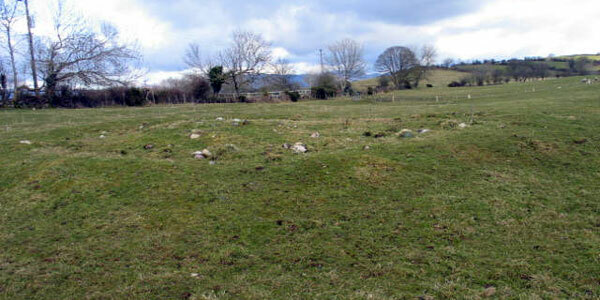 The unexcavated Circle 32 to the south of Carrowmore, with a fine view to Knocknarea.